You are currently browsing the Collector Model blog archives for August, 2015. 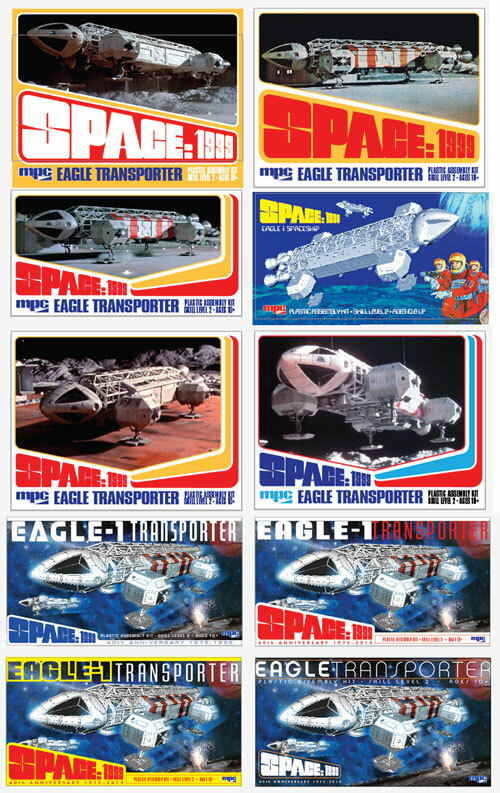 With the development of the new 22” Eagle model kit currently in the tooling stage I have started design work on the packaging. I’ll be illustrating the box lid personally on my own time. Jim Small pointed out the stunning illustrations done for the Matchbox line of kits by Roy Huxley. 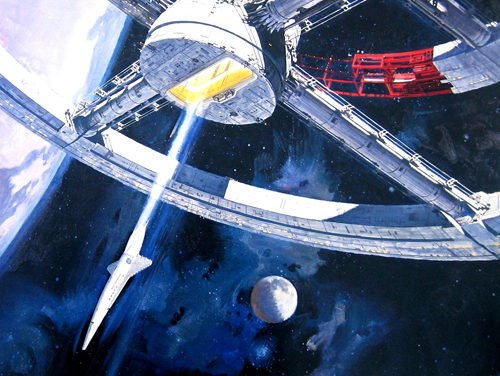 I’m taking them into account as well as Robert McCall’s work and focusing on his 2001: A Space Odyssey poster. Their art is very inspirational. I can only hope that my skills can pay them due homage. 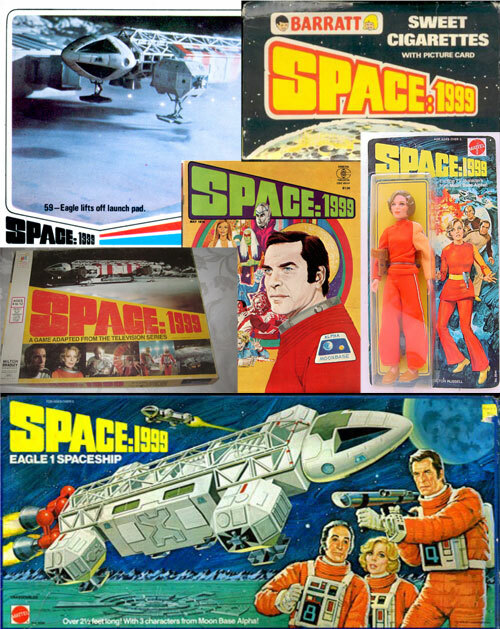 While digging into my illustration inspiration, I’ve been playing around with fonts and design motif’s that span the range from throwbacks to vintage Space:1999 products and collectibles like the old Eagle toy to contemporary takes that still keep a toe in the 70’s. Despite wanting to capture the look of the vintage products, I’m at a slight disadvantage because nearly every product uses the main three characters in a significant way. I can “cheat” by plugging in some of the other characters or putting everyone in helmets. Surprisingly after examining the size of the sprue frames and estimating a box size to hold them all it looks like we may have landed at the fortuitous box width of 22” wide. These are quick study layouts using screencaps of the Eagle just for positioning while exploring the rest of the layout and various motifs. 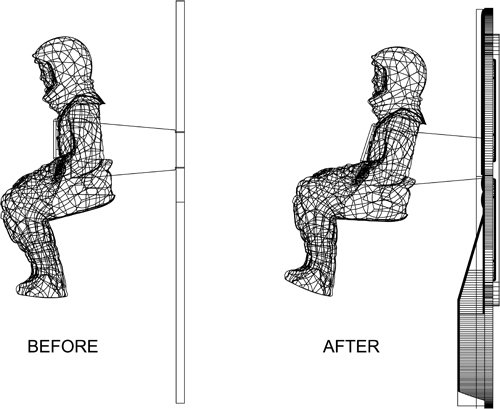 I’ve contracted a skilled digital artist named Ken Netzel to help with instruction sheet diagrams. 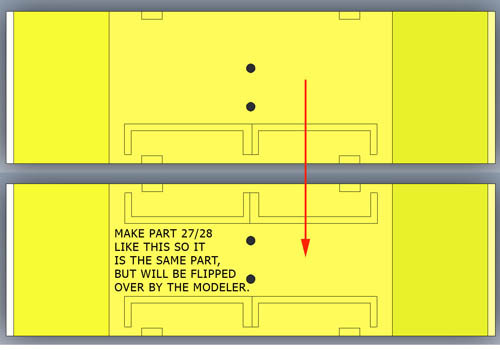 I’ve been playing around with how to best lay out the instructions. Though not what I would consider a knock-off by any stretch. I’m taking another cue from Matchbox instruction sheets, which had a very clean, nicely gridded look to them. 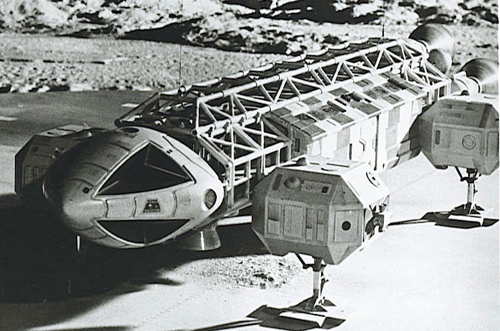 At this point we are about half way through our series on the new MPC Space:1999 Eagle transporter. 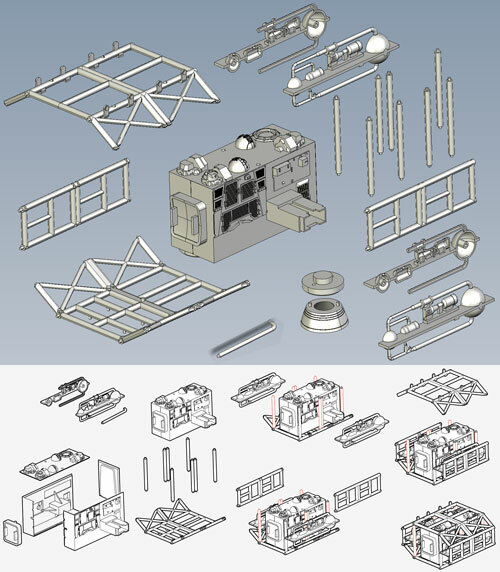 So far we’ve covered some of the kit features and the prototyping process. 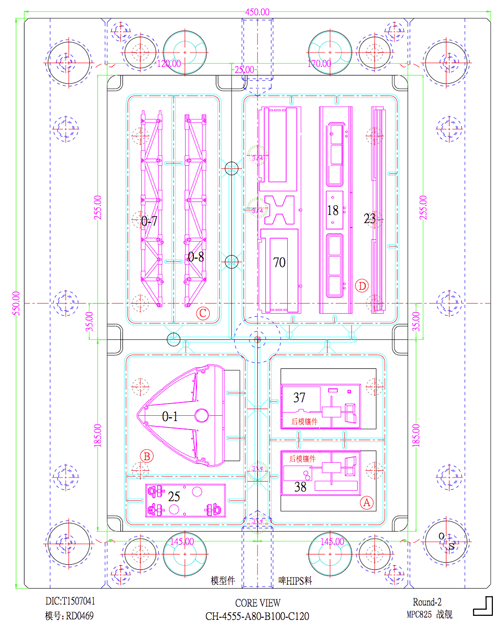 Since approving the digital mockup, I’ve been presented with a tool plan and layouts, which have since been reviewed and approved. 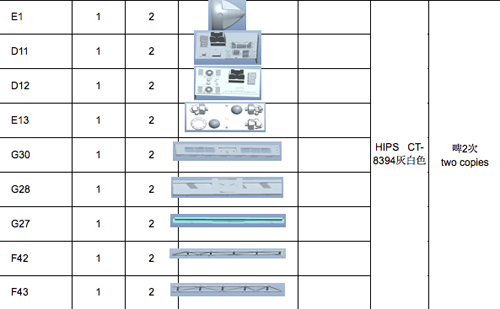 The tool plan is basically a listing of every part in the kit. It shows which tool they will land on, how many copies of the part are on the tool and how many times a given tool will need to be injected. At last count, we were in the neighborhood of 320 total parts in the kit! With all that done and all parts accounted for, the tooling process has begun. I expect to see test shots in early September! 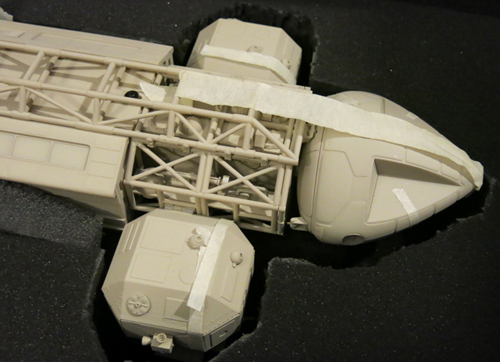 Continuing the look at our upcoming 22” Space:1999 Eagle from MPC… You may recall that we received the kit mockup just days before Wondefest. I was swamped with show prep, so it stayed in the box it came in until Jim Small did his repairs to it the day before we left. After displaying the prototype at the show, we found very few substantive errors when we gave it our thorough review. In a case of the 1:350 TOS Enterprise kit we probably had between 50 and 100 points to change between the first prototype and the end product. 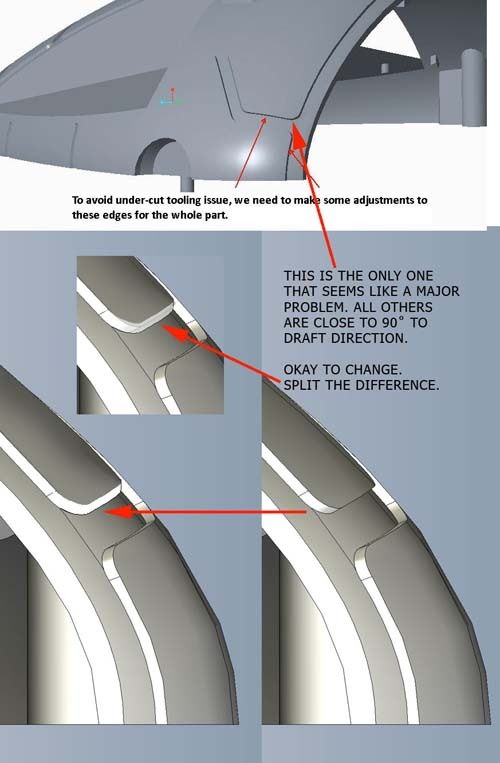 For this kit, we found about 10 things that needed to be corrected and a handful of other things had to be addressed like the cockpit wall and areas where tool drafting hadn’t been fully resolved. 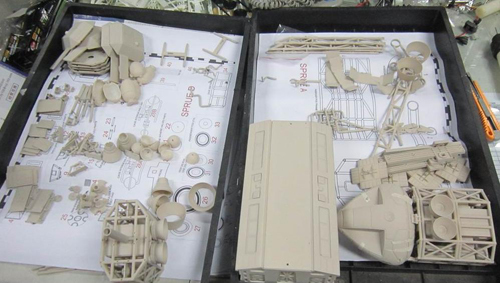 For the most part, what you saw in the Wonderfest mockup is what the end kit will be. I give all credit for that to my development partners Jim Small, Daniel Prud’homme and Chris Trice. Their research, data and their mindfulness of how the kit should be parted out, etc. really made a huge difference that took months off the development timeline. 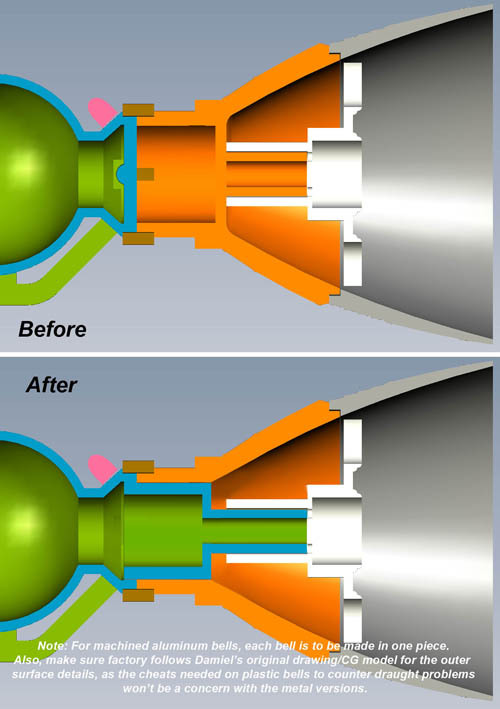 The differences were actually so minor that I didn’t require the factory to implement the changes to the mockup and instead reviewed them digitally only. Photos of the mockup were submitted to the licensor and it has been approved! 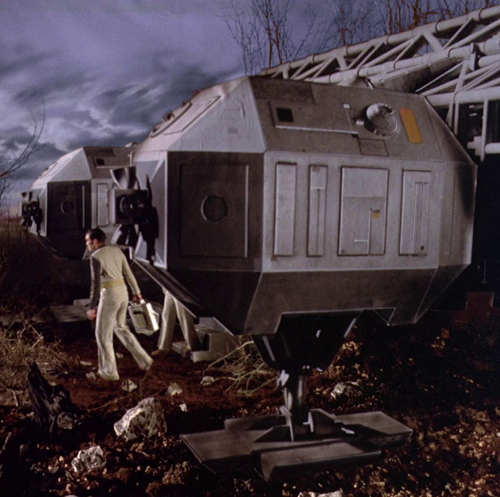 The kit is based on the ship as it appeared early in season 1. 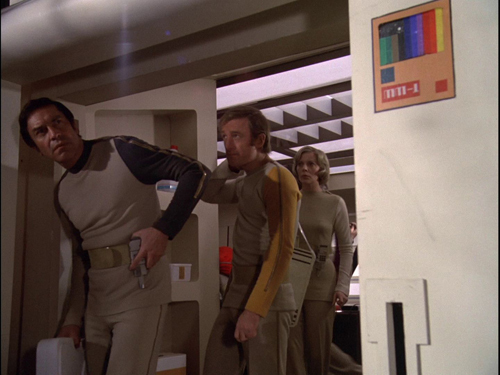 The model was redressed and details changed as filming went along. In some a few minor instances details have been simplified or compromised from how the miniature looked. 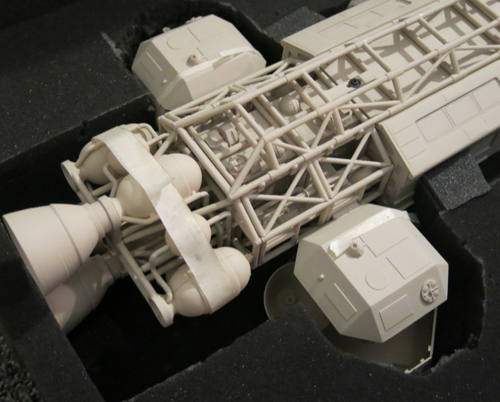 The sub-assemblies of the kit will go together in much the same way as the original did. 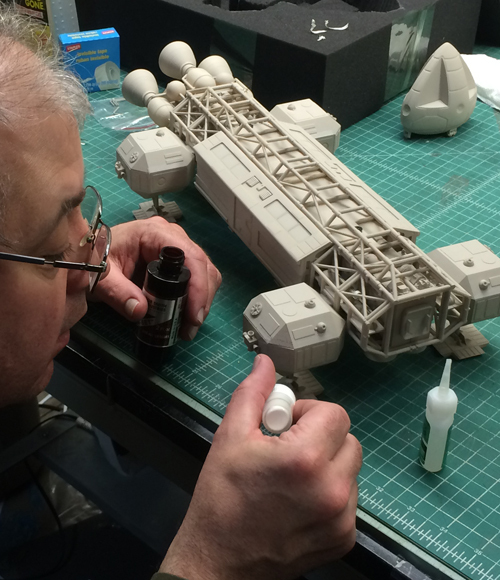 The kit will measure 21 5/8” long, which is exactly half the length of the 44” (it wasn’t quite that long) filming miniature that was used during filming of the show. The “true” length of the ship has always been a point of contention. 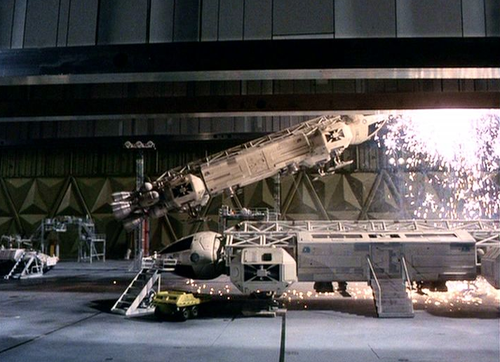 Like the Galileo shuttle in Star Trek, it has the Tardis-effect of being bigger on the inside than it is on the outside. 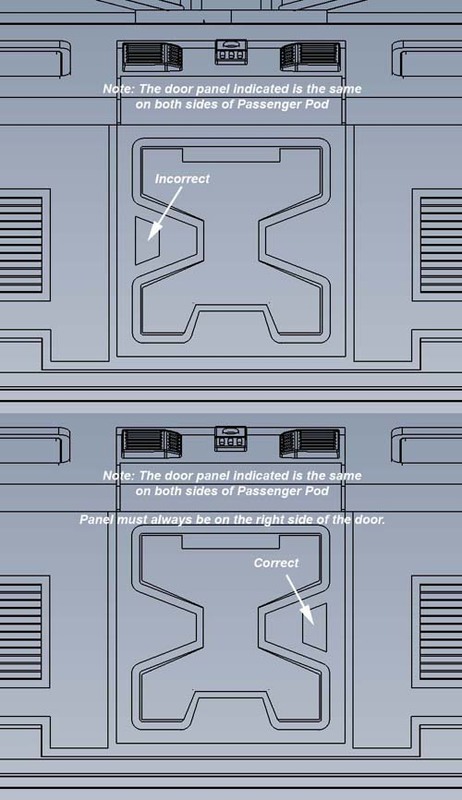 Most glaring is the fact that the doors on the personnel pod aren’t to scale with the doors martin Landau stepped through. The case can be made that the ship was longer. We landed on this length for two reasons. 1) 1/24 scale modeling materials were used to create both this miniature as well as the surrounding environments such as the MBA interior shots of the Eagle hangar. So, if you want to scratch build the environment to match the show, going exactly ½ scale from that is ideal. 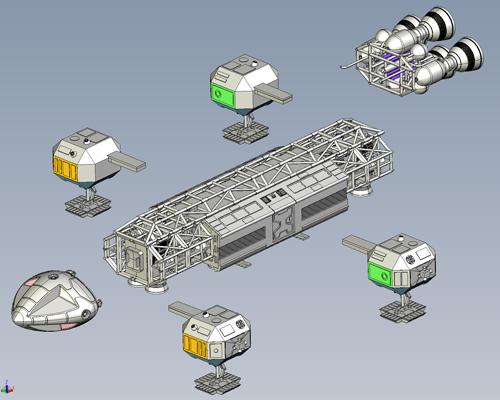 2) From the development budget standpoint, the kit parts would have outgrown the amount of tooling we had estimated. 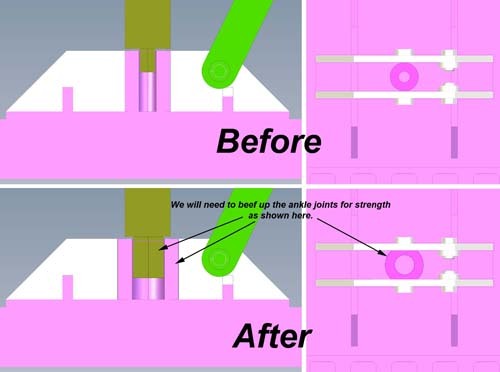 Even just a couple inches longer threw everything off and driven up the price of the tooling to the point we could not have managed it. In the end, we figured the market would accept a kit in the area of 2’ long that was properly detailed even if the scale stated on the box was to be ignored. In order to sidestep the debate, I generally refer to it as the 22” Eagle and only state the scale for the benefit of the parties that require us to assign a scale. 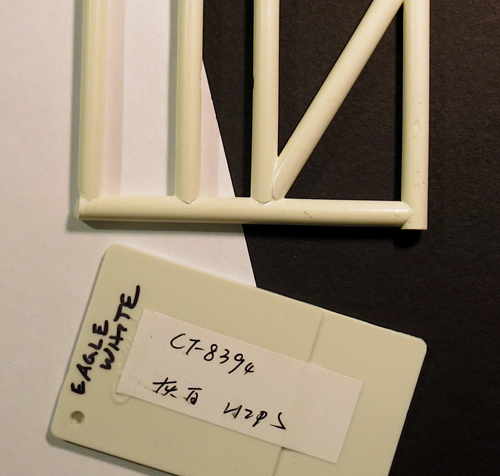 The kit will come injected in two colors, white and gray along with clear windows. The white plastic is a match to the paint used on the miniature. 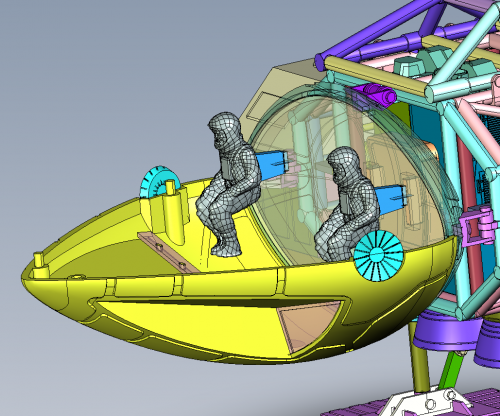 The kit will feature spring-action landing gear with articulated elbow joints. At the show we gave a look at the interior of the command module with it being a flat wall with figures mounted to it in much the same way as the original had. We have since found the opportunity to improve on this though and now that flat wall will feature relief detail that matches the interior set pretty well. A dash and console would barely be visible so those aren’t included. Again anyone that wants to add interior features like that as a scratch-building exercise will find the room to do that. 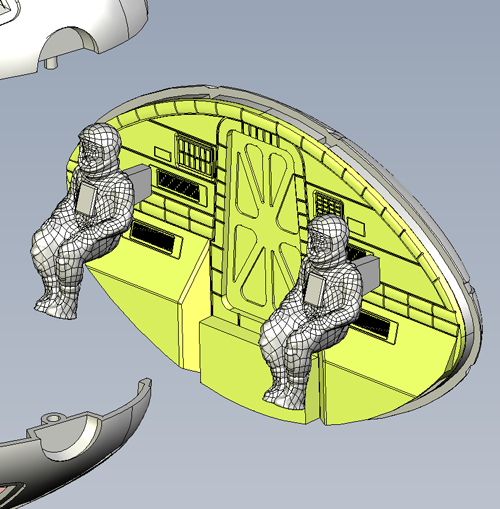 Some have remarked that they thought the use of a screw to hold the pod in place will be a bit of an eyesore even though the original looked that way. 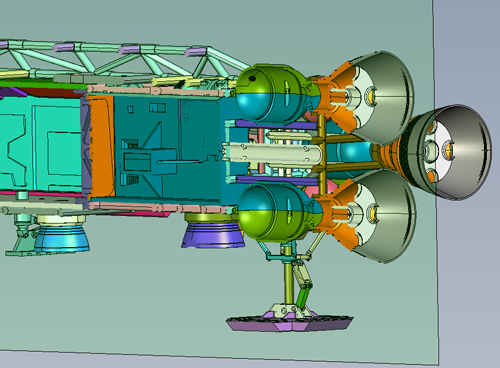 For the sake of the stability of the model, we do have other attachment points designed in that would hold the pod in place without the screw. For the purists that want a completely removable/swappable pod these attachment points have been designed for easy removal. 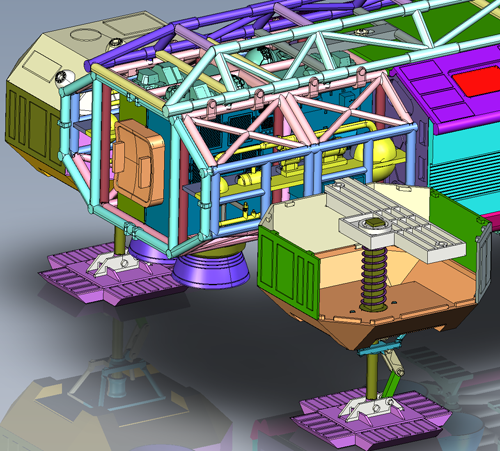 Enjoy a few peeks inside the model. 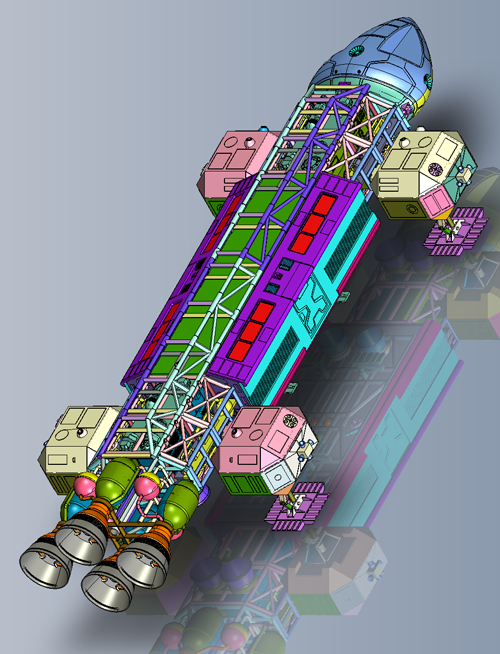 Next time I’ll talk more about the mockup.